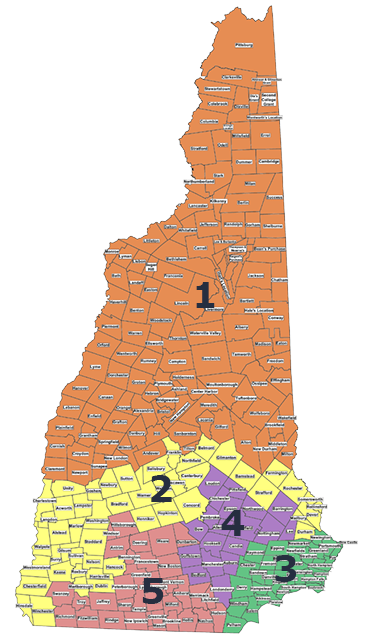 District 5 is the cities and towns of Amherst, Antrim, Bennington, Brookline, Deering, Dunbarton, Fitzwilliam, Francestown, Greenfield, Greenville, Hillsborough, Hollis, Hudson, Jaffrey, Litchfield, Lyndeborough, Mason, Merrimack, Milford, Mont Vernon, New Boston, New Ipswich, Peterborough, Richmond, Rindge, Sharon, Swanzey, Temple, Troy, Weare, Wilton, and Windsor, and the city of Nashua. The Council's Official website, with the upcoming schedule, current agenda items, approved minutes, and archives. After Council meetings, I post Meeting Notes of items I think of interest to our Council District 5. Why Do We Have an Executive Council? From our beginnings, and even to this day, New Hampshire has had, shall we say, a skeptical view of government. The Council actually had its beginnings in 1679 when King Charles separated the territory of New Hampshire from Massachusetts. When our state constitution was written later, the Council was created as a constitutional body to watch over the actions of our governor. The Council is a body of 5 elected people from 5 districts. Each Councilor represents about 263,000 people. The map shows the current Districts, after redistricting in 2011. Why is the Council Important? Approval of all significant state spending and that involves the major portion of our state budget. As you can see, the Council is important. The governor needs 3 votes to do almost anything. "The importance of the New Hampshire Executive Council far surpasses the small amount of recognition its members get from the press and the public. The five-member council was designed by the Founders to serve as a check on executive power, making it an important safeguard against cronyism, extravagance and graft. Its members vote up or down on all significant state contracts, all state judicial nominations and appointments of people to head all state agencies. It also sets priorities for all state highway projects. "Executive councilors are powerful people who get their phone calls returned. And, in addition to their other duties, that makes them informal ombudsmen for their constituents. They are often called upon to mediate disputes among individuals, communities and government agencies - another function that can place limits on government excess. So it makes a difference who serves on this key body." 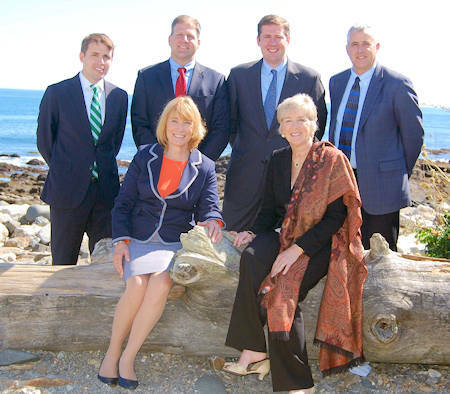 The state of New Hampshire has about 10,000 employees and they are directed by these agency heads. As your Councilor, I do not vote for any agency head who doesn't believe in the mission of the agency he or she wants to lead, or who doesn't have the experience, or who won't listen well. I vote for those who are respected by their peers, who are qualified, and who will listen. As we all know, a business, a school, and every other organization follows the leader of that organization. The tone is set at the top. My votes as Executive Councilor keep that in mind. I am always looking for good people and make sure that qualified men and women from District 5 get opportunities to serve. The third major duty of the Council is the approval of state contracts - they range from road improvements to service contracts to the purchase of goods. I do my best to approve the good ones and reject the bad ones. I don't vote for any contract that is laden with conflict of interests. And speaking of contracts, I work hard to make sure that businesses in District 5 who want state contracts got a fair shot at them.